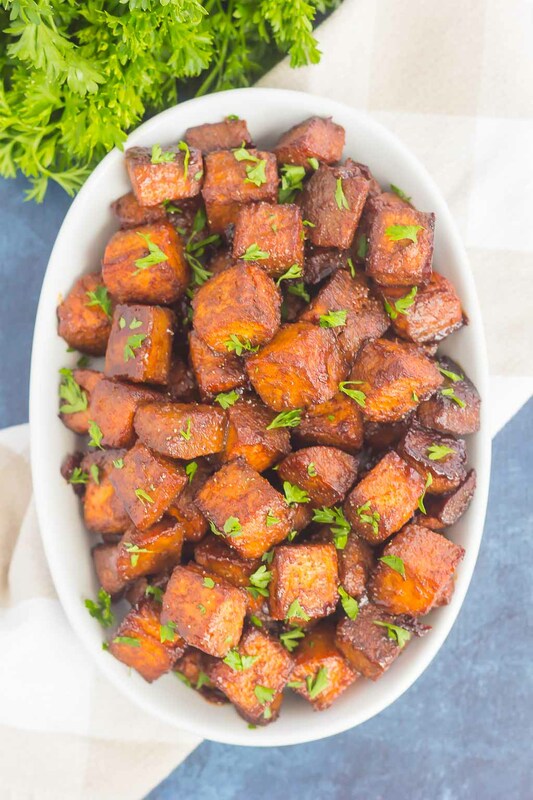 These Roasted Cinnamon Brown Sugar Sweet Potatoes make a deliciously simple side dish. 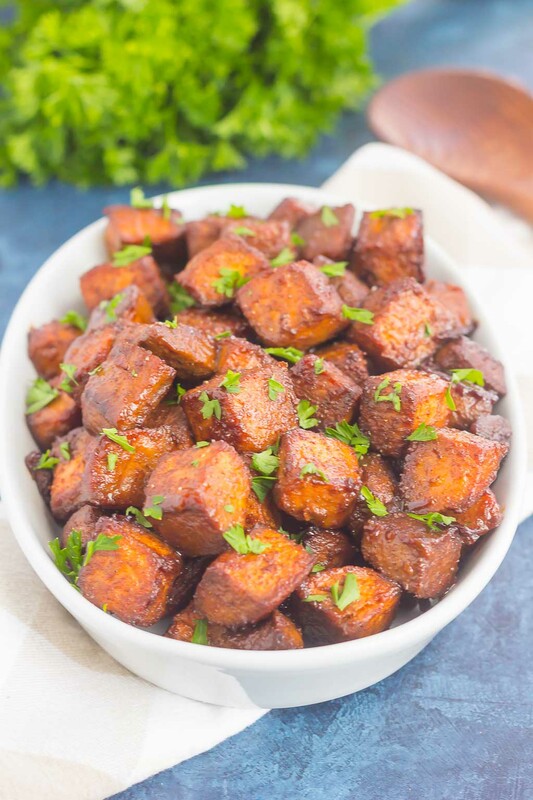 Sweet cinnamon and brown sugar are tossed with sweet potatoes and roasted until crispy on the outside and tender on the inside. 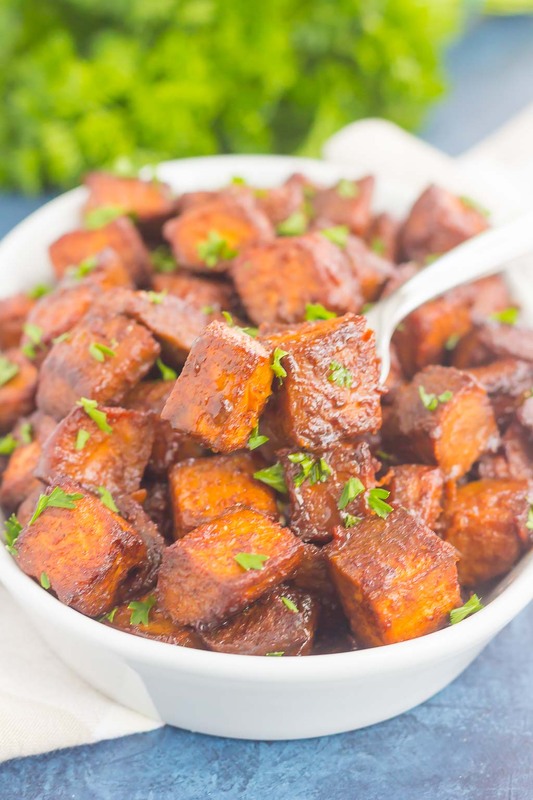 Loaded with flavor and easy to make, this dish is perfect for sweet potato lovers everywhere! It’s no secret that sweet potatoes are a big hit around here. 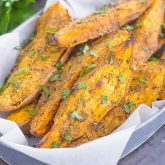 First came these Roasted Maple Cinnamon Sweet Potatoes, and then these Roasted Parmesan Herb Sweet Potatoes. You all sure love roasted sweet potatoes, and so do I…surprisingly! I’m sure I’ve told you about my dislike for sweet potatoes before, but if you’re new around here, let me fill you in. I’m only a recent convert to loving sweet potatoes, and even then, it can be kind of ‘eh’ for me. Growing up, I never liked any kind of sweet potatoes. And back then, it was usually the mashed or casserole kind that ended up on the dinner table come Thanksgiving or Christmas. I wouldn’t touch that dish with a ten foot pole, and I’m not kidding. Fast forward years later, and the only sweet potato that I kinda-sorta liked was the baked potato version with lots of brown sugar and butter. You know, where you can hardly taste the potato. Not very healthy by any means, but that caught my attention. When I started to experiment more with food and became a blogger, roasted sweet potatoes seemed to be taking the internet by storm. And since I love regular roasted potatoes, I decided to try my own. One where I can control the seasonings and spices. And that’s where my love of roasted sweet potatoes became obvious. 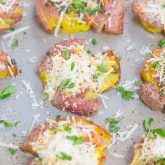 Now, I still don’t like the mashed kind or casserole versions, but I do love these Loaded Twice Baked Sweet Potatoes and those Garlic Herb Sweet Potato Wedges. It’s all about the seasonings to me. 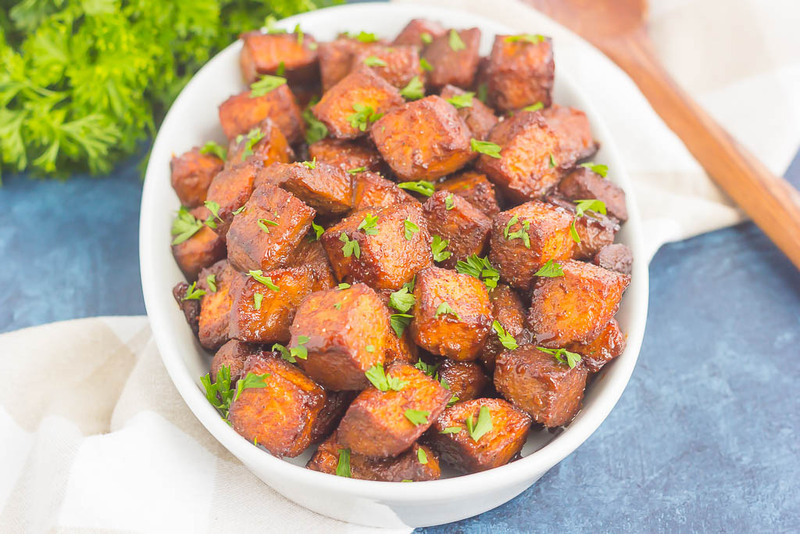 And since the holidays are fast approaching, I thought now would be the perfect time to debut my latest (and tastiest) sweet potato recipe! And if you love roasted sweet potatoes like I do, then you’ll go crazy over my newest version. 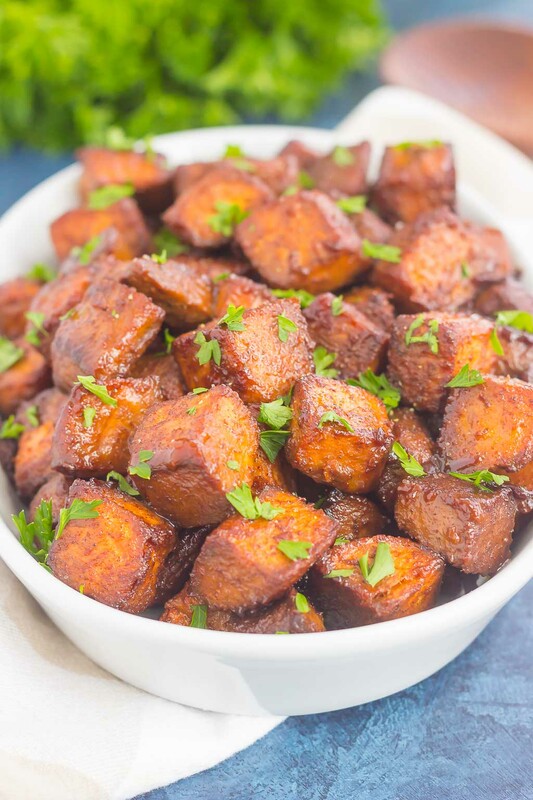 Cinnamon and brown sugar make a deliciously sweet combination when paired with savory sweet potatoes that are roasted to perfection. A touch of salt and pepper balances out the sweet to give you that one-of-a-kind flavor explosion that will leave you wanting more. This recipe, like all of my other sweet potatoes ones, is a breeze to whip up. The hardest part is peeling and dicing the sweet potatoes, which is just really time consuming. But, if you’re short on time, you can buy the pre-packaged sweet potato cubes in the grocery store that are already peeled and cut. I like to do this when I don’t have a lot of time to spend on dinner but still want a hearty side dish. Toss everything together, spread the taters out onto a baking pan, and let the oven work its magic. In about a half hour, these Roasted Cinnamon Sweet Potatoes are ready to impress. Filled with sweet flavors, yet perfect for that cozy feeling, this simple side dish will impress even the pickiest of eaters! 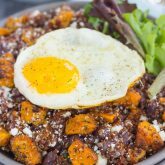 Looking for more sweet potato recipes? I’ve got you covered! Preheat oven to 400F. Lightly coat a large baking pan with non-stick cooking spray or line with parchment paper. Set aside. In a medium bowl, combine the olive oil, brown sugar, cinnamon, salt and pepper. Add diced potatoes and toss to coat. If mixture is too thick, add another tablespoon of olive oil. Spread potatoes in an even layer onto prepared pan. Mixture will look gloppy, but will thin out when cooking. Bake for 32-35 minutes, or until lightly browned and crispy, stirring halfway through cooking. These look wonderful! And I like that you didn't use too much sugar. I already find sweet potatoes sweet (thus their name!) and so many people smother them with sugar and marshmallows!